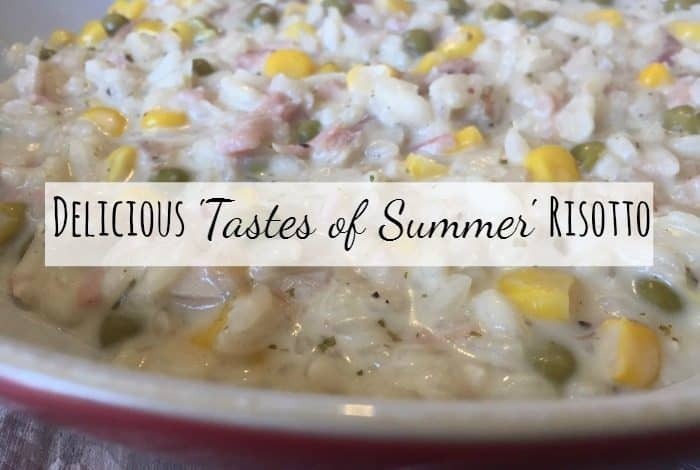 Delicious ‘Tastes of Summer’ Storecupboard Risotto…. Isn’t it mad how the best recipes always come from the times when you just fling whatever you have to hand in a pan? Or is it just me that happens to? 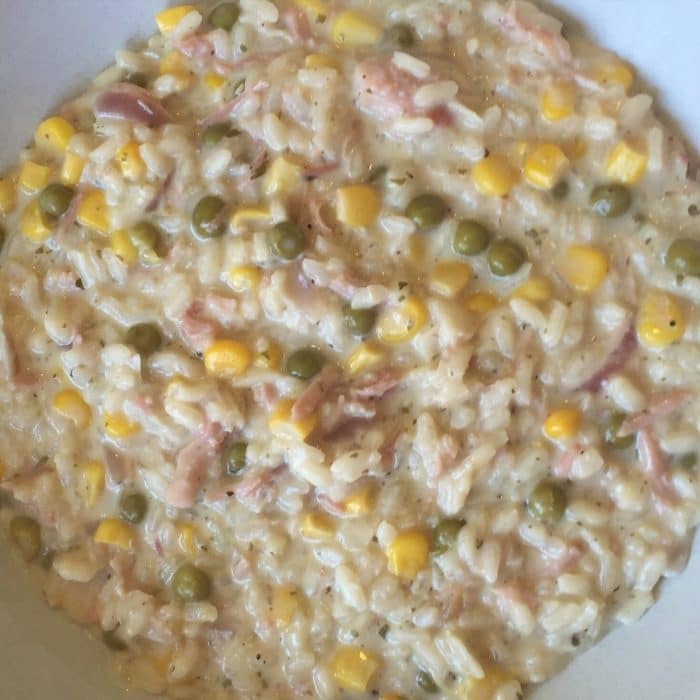 This amazing risotto came about almost by accident when I was looking for a way to use up some leftover gammon from the Sunday roast. I’d forgotten to buy some Parmesan cheese which always adds that extra depth to risotto so I decided to use half a tub of Mediterranean flavour Philadelphia soft cheese instead and it was genuinely amazing! This made two generous sized portions so bear in mind you’ll need to double the recipe if you’re making it for more than two of you as a main meal. When the stock has been mostly absorbed you can add the next third and continue stirring until that’s almost been absorbed too. At that point, throw in your sweetcorn, peas and gammon (or chicken) and about half of what’s left of the stock. Keep stirring and then keep adding the last of the stock in small amounts until the rice is completely cooked through and the stock has been absorbed into the risotto. You might not need all of the stock or you might even need a little more once you’ve ran out but I just use boiling water if ever this happens. Once the rice is cooked take it off the heat and stir through half a tub of Mediterranean flavour Philadelphia soft cheese and grind some black pepper on the top before serving. If you liked this recipe you can save it to your own recipe box if you use Yummly – just click on the YUM icon at the bottom of this post. 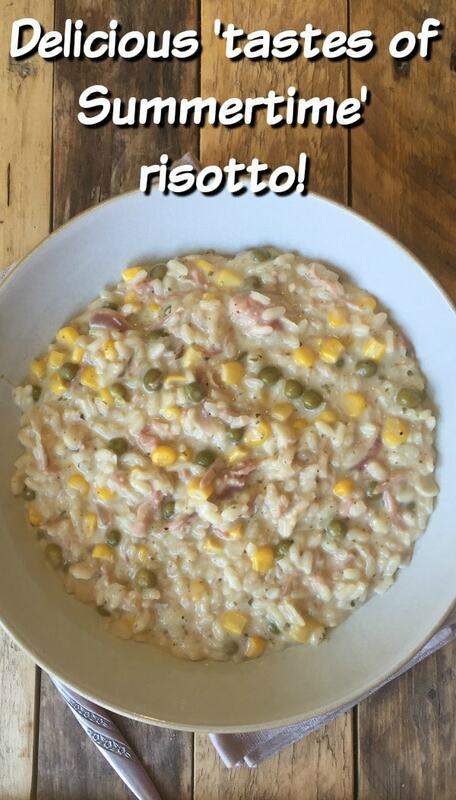 Oh I love risotto, my kids won't touch it though – I think i need to start eating without them!! Such a great idea to use soft cheese, I can imagine it would make such a creamy risotto! Oh yum! We're having risotto tonight, it's our usual Monday dinner using up the leftover roast chicken from Sunday. Love that it's so versatile though. My mouth is watering at your risotto, and it's teatime here in our house, so I think I may print off this little recipe and see if I can make something similar. Thank you for sharing. oohhh i have the majority of those ingredients in my house. I absolutely love risotto!! I love risotto, somehow it manages to be comfort food , warming and light all at once. A lovely looking recipe you have here. We often have those ingredients in, so this would be an easy one to make.